Yosemite awes us with its imposing valley views, made famous by Ansel Adams so many decades ago: El Capitan on one side, Bridalveil falls on the other, Half Dome at the back. It’s a marvel to behold — if you can see through the wall of selfie-stick-toting tourists, that is. If you want to experience Yosemite in solitude, go mid-week in winter. 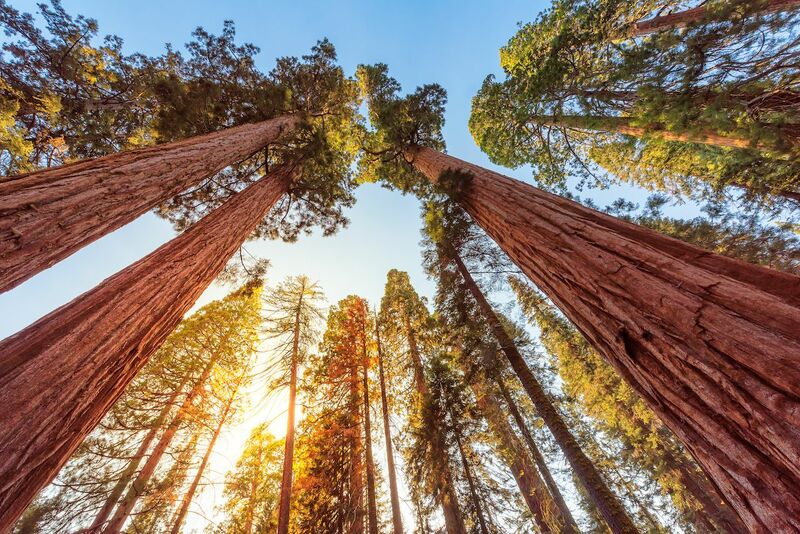 Any other time, if you want to savor California’s superlative natural beauty without the crush of crowds, visit Sequoia and Kings Canyon National Parks. Here’s why. Sequoia National Park is the oldest national park in California and second in the US only to Yellowstone. Sure, its establishment as a national treasure in 1890 only preceded Yosemite by six days, but it was right up there with the most country’s famous national parks. Sequoia’s neighbor, Kings Canyon National Park, was established five decades later and has been administered together with Sequoia since the 1940s. Together, the two parks in the middle of California occupy over 1,350 squares miles, an area larger than Yosemite to the north. They’re separated from Yosemite only by the Sierra National Forest and National Monument — which means that they’re all part of the same undeveloped wilderness area, full of oaks, multiples pine species, firs, and giant sequoias, as well as animals in every size, from squirrels and bobcats to mule deer and black bears. Sequoia and Kings Canyon also have major elevation gains, a rise of nearly 13,000 feet from their lowest to their highest points — making for an incredible diversity of habitats throughout the park. Kings Canyon and Sequoia have, well, sequoias. Sequoia National Park probably beat out Yosemite by six days in earning national park status because it holds an amazing treasure: the largest tree on Earth. The monumental German Sherman tree is a sequoia redwood — also called a giant sequoia — with the largest mass of any individual living thing on the planet, reaching 275 feet off the ground with a base circumference of 102 feet. The trees’ lower branches are as large as many regular trees, but you can’t see those lower branches up close since the lowest one is 130 feet off the ground. Understandably, the sloping path to the world’s largest tree is not blissfully people-free, but the hilly walk through the Giant Forest alongside the majestic sequoia redwoods is a humbling and serene experience. The massive trees are anywhere from hundreds to 2,000 years old, and you have to step back a good distance just to take one in. The second largest tree in the world, the General Grant tree, is in Grant Grove in Kings Canyon. In fact, before Kings Canyon was named a national park, a smaller area that included Grant Grove was already a national park. The Grant Grove Trail is a short, half-mile trail close to the main visitors center, so, like Giant Forest in Sequoia, it’s the one place in Kings Canyon that has more visitors. Walk just a little further, though, and the trails are blissfully calm. One trail that doesn’t have a lot of visitors, but should, is Big Stump Trail, a short drive from Grant Grove. It is, as the name suggests, an unhappy reminder of how foolishly humans have treated this natural wonder. After the 311-foot-tall Mark Twain tree was cut down in 1854 — so as to take a slab of it to the Museum of Natural History in New York — its age was estimated to have been 1,350 years old. Glaciers created granite walls here, too. The glaciers that carved up Yosemite Valley, leaving its famed granite walls in their wake, reached down to Kings Canyon and Sequoia, as well. From Zumwalt Meadows in Kings Canyon, you can look up to the Grand Sentinel, a slab of rock that rises 3,000 feet above the valley floor, roughly the same distance as Yosemite’s El Capitan. In Sequoia Canyon, Moro Rock is a silver-grey bulge that juts out from the mountainside. A hike to its peak, over a dizzying staircase carved into the rock by the Civilian Conservation Corps in 1931, rewards with a stunning panorama over the valley with the snowy Sierras in the distance. While Yosemite has breathtaking waterfalls, the glaciers that carved up this area left behind valleys and canyons with rivers, waterfalls, and cascades of their own. In spring, Kings Canyon’s aptly named Roaring River is also home to Roaring River Falls, which, while not deep, gushes a huge amount of water in a small space. Deeper into the valley are Mist Falls and Grizzly Falls. 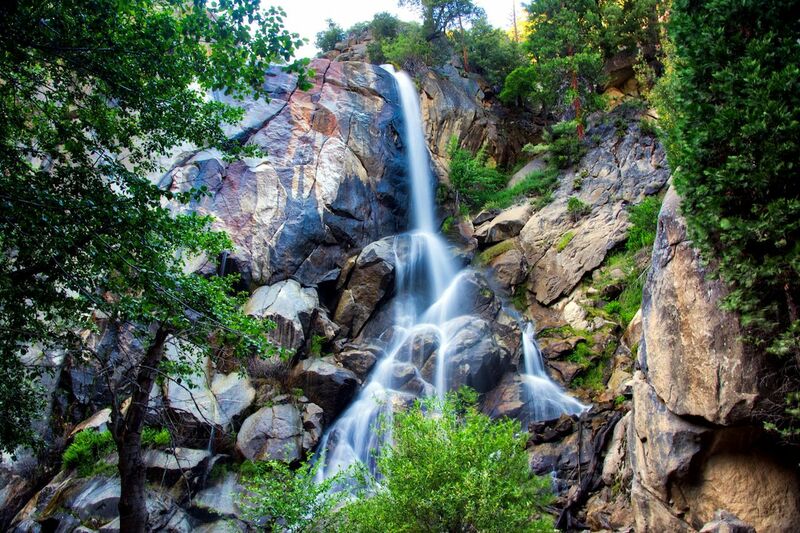 In Sequoia National Park, Topeka Falls are actually a series of cascades that stretch almost 1,200 feet from top to bottom. Sequoia and Kings Canyon reach much higher than Yosemite. While Yosemite may have the tallest waterfall in North America, Sequoia National Park has, as we already know, the biggest tree on the planet. It’s also home to the tallest peak in the lower 48 states: 14,505-foot-high Mt. Whitney. 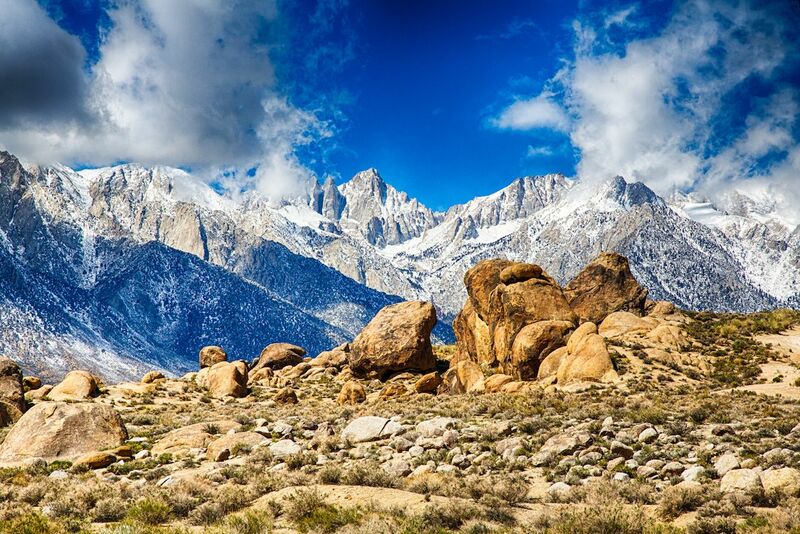 In fact, Sequoia and Kings Canyon are each home to a half-dozen mountains over 14,000 feet. Between them, the parks have 45 peaks that dwarf Yosemite’s tallest one, 13,150-foot Mount Ritter. The soaring peaks of the Sierra Nevada make for incredible snow-capped views from multiple viewpoints throughout the parks. The high topography is also home to stunning alpine lakes. 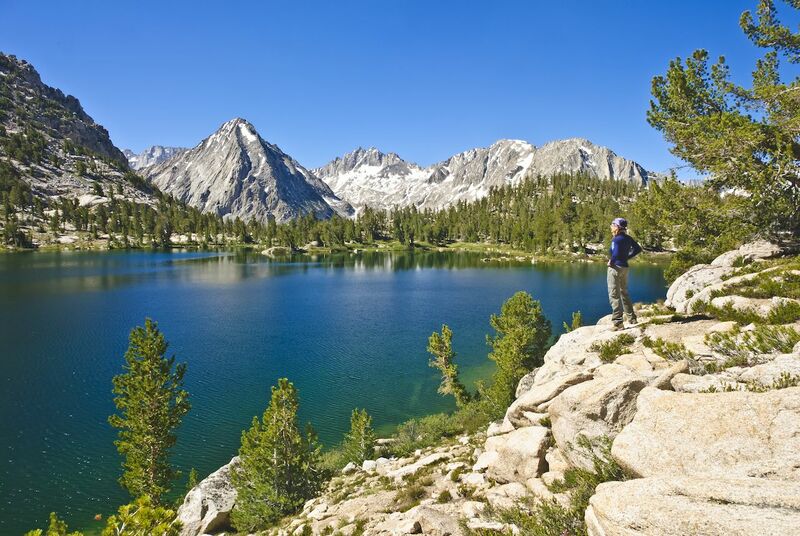 The Lakes Trail in Kings Canyon, which starts at the Wolverton parking area trailhead, goes in one direction to Heather Lake, Emerald Lake, and then Pear Lake. Depending on how far you go, it’s an eight-, 10-, or 13-mile loop. Likewise, Sequoia National Park’s height and remote location make it an incredible place to contemplate the night sky. Sequoia even hosts an annual Dark Sky Festival in September, and throughout the year you can partake in free astronomy tours from the Wuksachi Lodge. With their hefty size and massive elevation gain, Sequoia and Kings Canyon are home to multiple different habitats. While its warm foothills are home to the grey fox, bobcats, and striped skunks, you’re most likely to spot pocket gophers, white-footed mice, and western whiptail lizards there. Occasionally, you’ll encounter black bears, so you should stow your food accordingly, leaving none even in your locked car. Near their meadows, you have a better chance to spot black bears, which actually come in shades from golden brown to black. Depending on the time of year, you’ll almost certainly find mule deer. Higher up in the Sequoia’s subalpine area, pika (cousins of rabbits with shorter ears), marmots, and white-tailed jackrabbits abound. Descending from the High Sierra Trail to Big Arroyo, you might catch several bighorn sheep who were translocated there a few years ago. The parks have an astonishing 800 miles of trails between them, including portions of the famed 221-mile John Muir Trail. You’ll find everything from easy meadow strolls to strenuous hikes up into the high alpine. 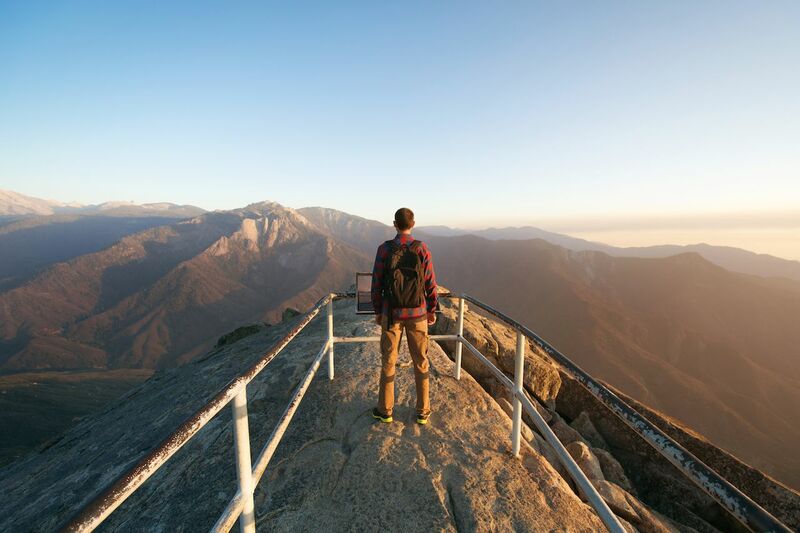 From the must-see Giant Forest, you’re not far from Moro Rock, a lookout point with jaw-dropping valley views. In Sequoia, the Crescent Meadow Trail is a lovely walk in the spring when the meadow bursts with flowers. In the subalpine, there’s a nearly seven-mile loop from the 8000-foot-high Mosquito-Eagle Lake parking lot to 10,400-foot-high Eagle Lake. In Kings Canyon, the 8-mile Mist Falls trail takes you from the trailhead at the end of Highway 180 up 1500 feet to the falls. The Cedar Grove Overlook takes you up five miles of switchbacks for great canyon views, while the Zumwalt Meadow Trail is an easy walk inside the stunning meadow, with views of the Grand Sentinel and probably a few deer. They’ve got every type of place to stay. Sequoia and Kings Canyon have dozens of campgrounds, including Sequoia’s petite Buckeye Flat in a picturesque oak grove. Also in Sequoia is Lodgepole, near the giant sequoias and the general store. Both of those parks are open from spring to late fall, but check for exact dates online. In King’s Canyon, Sunset Campground is a shady area with lots of sites close to Grant Grove Village. Add to that summertime ranger programs, and it’s a good family option. Reserve these campgrounds online. First-come, first-served campgrounds include the remote Atwell Mill in Sequoia. It has running water only through mid-October, so check opening dates online. Cold Springs is Sequoia’s highest campground is at 7,500 feet, but you can still drive into most of the campsites. There are 110 sites at Kings Canyon’s Azalea campground, and a handful are open year-round. If you’re not camping, the Grant Grove Cabins in Kings Canyon come in differing levels of rusticness and are within walking distance to the General Grant Tree. Also at Kings Canyon, the John Muir Lodge has all mod cons and a woodsy feel. In summer, the Cedar Grove Lodge is a low-key lodge next to the Kings River. While it’s not quite the Yosemite Majestic Hotel, Sequoia National Park also has fancy lodging of its own. The inviting Wuksachi Lodge is close to lots of hiking trails and cross-country ski routes. 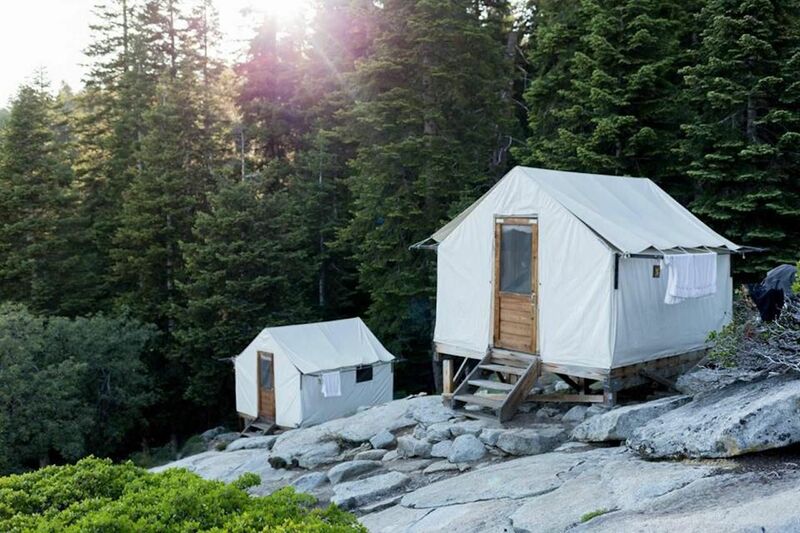 One of our favorite places to stay is the Bearpaw High Sierra Camp, perched on a granite peak in Sequoia. It’s got just six tent cabins, so reserve well ahead. You reach it after hiking 12 miles up the High Sierra Trail. There, a staff cooks breakfasts and dinners, and you can take short, hot showers. Together with unparalleled alpine views, it’s your reward after a strenuous trek — and what a reward it is.